Oil and gas prices are incredibly volatile. That’s why the best business models in energy largely avoid exposure to commodity prices. It's tough being in the energy business. From out of nowhere, oil and gas prices can decide it's time for a change and come crashing down. When this happens, it leads to the gut-wrenching volatility we've seen over the past year. This volatility can wreak havoc on an energy company's ability to operate if its business model is exposed to those prices. On the other hand, companies with a business model that is unexposed to the volatility of commodity prices can actually thrive in the energy industry. Here's a closer look at how to find the best business model in the sometimes erratic energy space. There are basically two ways a company can make money in the energy industry. One option is to try and make a living off of the actual commodities, while the other main option is to charge a fee for performing a service to those trying to make money off the commodity. 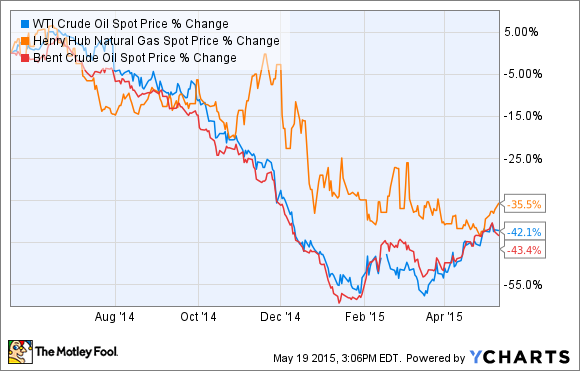 There are a lot of ways a company can make money on commodity prices. It can pull oil and gas out of the ground and sell it to the market, while another can buy it to refine it and sell the higher valued refined products. In either case, the company is making money off the spread between its costs and the sales price. These companies can make a fortune when those spreads are wide, but can go belly-up if the spreads are squeezed for too long. On the other hand, companies that charge a fee avoid direct exposure to commodity prices and, therefore, the volatility of these spreads. There are a number of fee-based businesses in the energy space. Oil-field service providers, for example, earn fees for drilling and completing wells, while rig companies get paid a fee for leasing their rigs to drillers. Meanwhile, energy midstream companies charge a fee for the capacity in their pipelines and processing units. These fees tend not to fall quite as dramatically as commodity prices, which provides a bit more stability to earnings. A fee-based business model is great as long as those fees aren't at risk of being reduced when oil and gas prices reset. That's what is happening to oilfield service companies at the moment, as their fees are being shaved by cutthroat competition. On the other hand, companies with fees backed by long-term contracts, like what many energy midstream companies use, have been largely immune to the current downturn. A great example of a company that employs this business model to great effect is energy infrastructure kingpin Kinder Morgan (NYSE:KMI). As noted on the slide below, the company earnings are 85% fee-based for 2015 and 94% fee-based or hedged, which has locked in nearly all of the company's cash flow in the year ahead. Because so much of the company's cash flow is secured by fee-based contracts, Kinder Morgan is projecting that its dividend is rock-solid for 2015. Better yet, the company believes it can easily grow the dividend by double-digits through the end of the decade since it has a robust pipeline of fee-based assets in the process of being built. That security and clarity isn't something that companies with revenue that is highly exposed to volatile commodity prices can replicate, as many of these energy companies cut or eliminated their dividends as oil prices tanked in the past year. Because of the volatility of oil and gas prices, energy companies with a business model exposed to those prices can be deeply affected when prices change. That's why a business model based on fees is a much better route, especially if those fees are locked in by long-term contracts.